Ever since I was about five years old I loved fringes. All the girls in my elementary class had the typical short or long hair style with straight across bangs and I envied them. As a kid I wanted to have bangs myself and have the same hair style as everyone else. Even my sister had them but for some reason my mom never styled my hair that way. I already felt so different from everyone because I was the only red head in the entire school. That being said I remember going into my grandmas bathroom and I cut my own bangs and as soon as I was 'done' I immediately regretted it. It looked so horrible plus this was a maybe six year old trying to cut hair straight. From that day I came to terms that maybe a fringe just wasn't for me. Years later, I still loved how bangs looked and how good they looked on so many girls. It wasn't until last summer that the thought of cutting mine sparked up again. I thought long and hard about possibly chopping my bangs. At the time I had my hair parted down the middle and my bangs were as long as the rest of my hair so it was a bit of a scary thought to chopped them so short. Like most people when they are contemplating a change they worry whether the change will look good on them or not. I threw the idea to Rudy and a lot of my friends to have as many opinions as I could get and everyone was on board with me. I made an appointment got rid of the ombré I had going on and chopped off my bangs and I don't regret it one bit! This has become a long intro already. I constantly get people complimenting my bangs and hair all the time along with them telling me that I make them want to get bangs themselves. Even though I absolutely love having my fringe there are some things that are annoying about them. Today I want to share with you guys some pros and cons of having a fringe before you decide to chop off your hair. These are all just my opinions. - Plain and simple they're cute! - I think bangs looks really good styled with a top bun. In the past I would just have my hair pushed back which I always thought it look like something was missing or I looked naked. - They are so easy to style! Comb and straighten, and you're ready to go! - They really can make a look. Like I said before I had bangs I used to have a middle part and my bangs were as long as the rest of my hair. So many times I felt my hair was boring. Now with bangs it's a completely new look. - Bangs can make you look youthful and who doesn't want to look young for as long as they can? - Since your bangs cover your forehead you don't have to put make up there. I guess you can also kind of save a little on makeup with that which is a pro. - If you have a zit on your forehead, guess what? Your bangs will hide them! - Depending on the length of your fringe you don't have to worry too much about your eyebrows looking perfect since they can be covered. - If you ever change your mind about having bangs they usually grow pretty fast. - With having cute bangs during hot days you can get a sweaty forehead which isn't fun. - I have noticed that my bangs get oily so quick and faster than the rest of my hair. Shout out to dry shampoos, my new best friend. - On hot days and when my bangs are a little longer than usual they rub on my eyebrows causing my brows to smudge! - When I shower I need to use lots of bobby pins to hold them down if I'm not washing my hair. Which let's be honest I rarely do. - I find it so hard to separate my bangs together from the rest of my hair once I'm done washing it and that bothers the crap out of me! - They grow way too quick! - My bangs are more high maintenance than I am. I literally have to get weekly trims if I want to keep them at the perfect length. So if you go get your bangs cut at a salon it can get expensive. I now cut mine myself. - When my fringe is long they start poking my eyes. - Either when my fringe is oily or too long I get random gaps in them and that drives me crazy. There will always be cons to anything but in this case I think the pros outweigh them. I do not regret them and it's already going on a year of me having them. 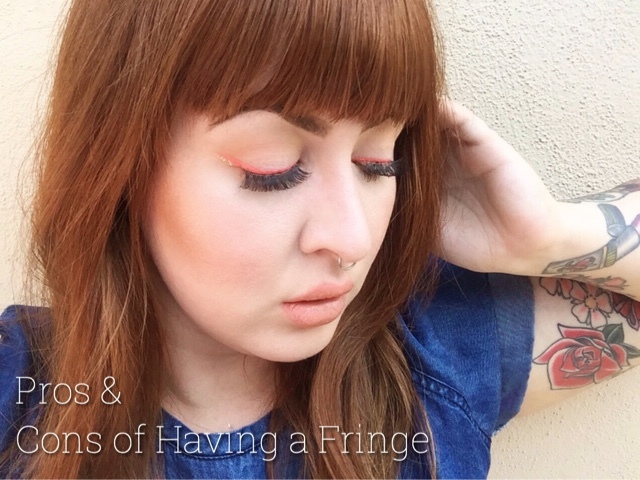 This all will depend on how much you really want to have a fringe. I hope these pros and con help any of you that have been debating on getting a fringe or not. If you don't like them its hair it'll grow back and quick too. I still want bangs, it's been years since I've had bangs. Maybe I'll get bangs when I re-dye my hair. You should! I think it would look really cool with your gray hair.